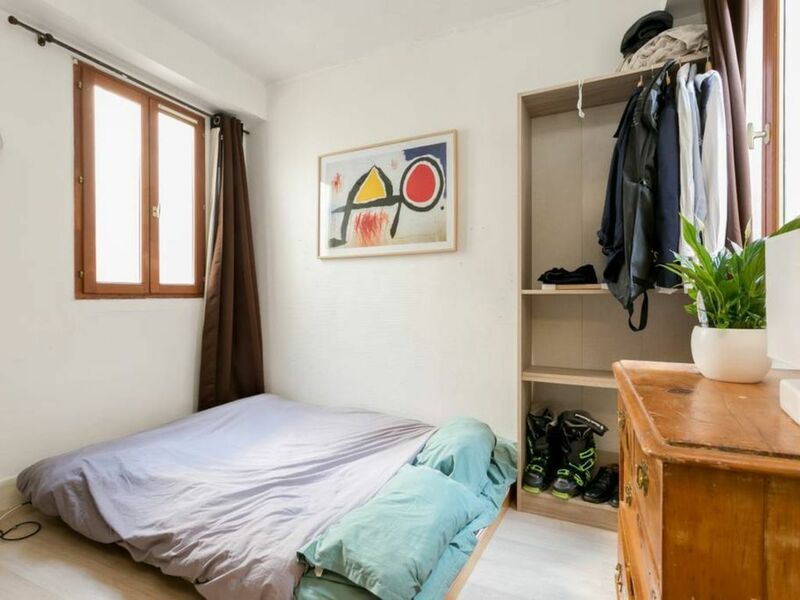 Located right next to Notre Dame Cathedral on the historical Ile St. Louis in the centre of Paris, this is a small, well-lit studio with everything needed for two people for a visit to Paris. Contains wifi, kitchen, bathroom with toilet & shower. Kitchen includes, oven, microwave & hotplate. Within five to ten minutes walk of many famous Paris landmarks including Notre Dame, Place des Vosges, Panthéon, Musée Picasso, St Chapelle. Within fifteen minutes walk of the Louvre. English living in Paris. Speak English, French, Spanish. Near most tourist attractions by foot. Lo studio è situato a pochi minuti a piedi dietro Notre-Dame, posizione eccezionale. Perfetto per due persone che amano vivere Parigi e non vivere in casa. Lo studio è ubicato al 5’ Piano servito da un piccolissimo ascensore, ci può salire una persona per volta. La pulizia è stato di manutenzione dello studio sono medi. Paul è disponibilissimo ad ogni nostra esigenza. Sistemazione consigliata. Le studio est situé à quelques minutes à pied de Notre-Dame, emplacement exceptionnel. Parfait pour deux personnes qui aiment Paris et ne vivent pas dans la maison. Le studio est situé au 5ème étage desservi par un très petit ascenseur, vous pouvez monter une personne à la fois. Le nettoyage et l'entretien de l'étude sont moyens. Paul est extrêmement disponible pour tous nos besoins. Logement recommandé. The studio is located a few minutes walk behind Notre-Dame, exceptional location. Perfect for two people who love Paris and do not live in the house. The studio is located on the 5th floor served by a very small lift, you can climb one person at a time. The cleaning and maintenance of the study are average. Paul is extremely available for our every need. Recommended accommodation. Very good studio, in a wonderful location! A little and very good studio: a room, a good kitchen and a bathroom. Fifth floor, with a very small elevator, just for one person. The owner, Paul Evans, was always very kind. The location could not be better: a 3 minutes walk to Notre Dame! Many good restaurants in the area. The best thing about the apartment is that it is in a great central location - a lot of the tourist sites are easily accessible by walking and it is really nice to be so close to the river and Notre Dame cathedral... The apartment itself is small and basic. Paul was helpful by having the key ready for collection when we arrived at check in time and giving directions on how to get to the apartment. He also let us keep our bags for a few extra hours. The apartment is on the top floor, there is the tiniest lift that i have ever seen to take you up or lots of stairs. However, as the apartment is internal facing - so not the best for views... The apartment was also warm which was much appreciated on a cold weekend in Paris. We didn't find any local supermarkets/ convenience shops - the nearest seemed to be about 10 minutes away - however lots of Bistros and gift shops in the vicinity. The only downside was the toilet /shower area was fairly smelly - but manageable by keeping the door closed. Also, as the walls are quite thin, the sound of neighbours coming in and out at night time can be heard. Paul was very communicative and helpful and the apartment was in the perfect part of town! The walls are thin so the neighbors can be heard when playing music etc but it was not a bother at all! Loved it. Thank you! Best possible location in Paris. Walked to the Louvre crossing only one road... along the river. Loved it.